A multi terrain 10km race starting and finishing in the picturesque village of Bishop Monkton. 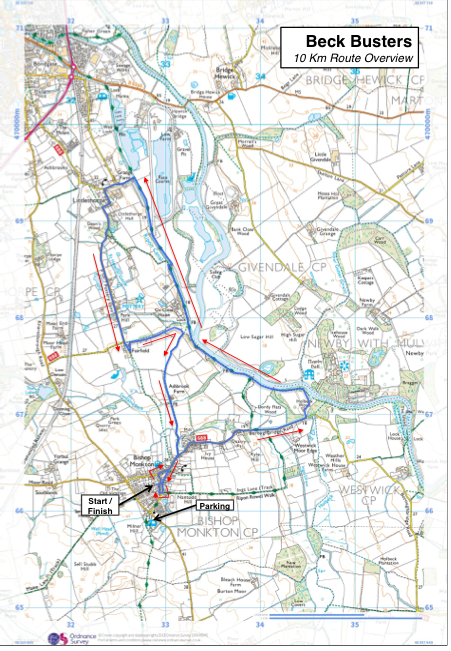 Starts and finishes in the village, taking a circular route that starts on road before heading alongside the river Ure and then besides the canal, then through the pretty village of Littlethorpe before heading back across country to Bishop Monkton. Finally, the race will finish with a run through the beck (pictured). Fun run entry forms are available directly from us at beckbusters@gmail.com, or sign up on the day. Results for the Beck Busters were last updated on Sunday, 30 September 2018 11:32. Parking available at Church Farm Caravan Park. Can leave bags at school at own risk.